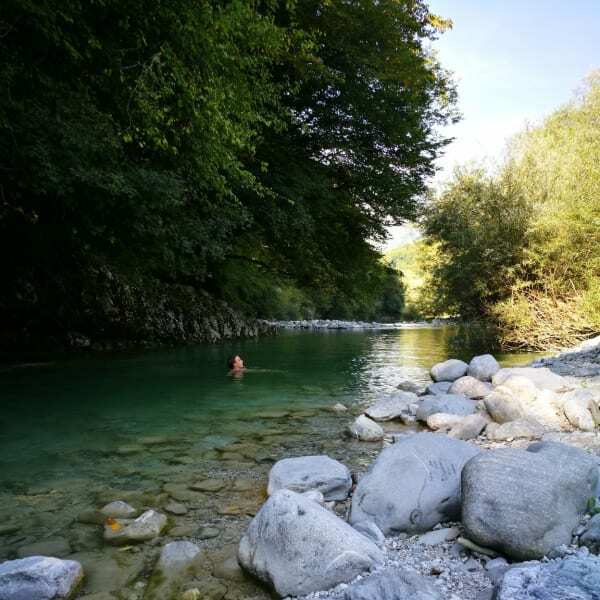 Holiday farmhouse Škvor: Relaxing holiday between pastures viewing Alps in the still undiscovered part of one of the most beautiful destinations in Europe – Julian Alps – Soča river valley - Slovenia! You are welcome to stay at one of our traditional, recently renovated guesthouses. The spacious houses, decorated with tastefully combined traditional and modern elements, allow for complete privacy. Add the remote location of the village itself – and you get a holiday that is different from anything you have ever experienced. Children are free to run around safely while they parents barbecue delicious meals on the garden grill. One of the distinct features of our farmhouse is a large vegetable garden that we love to share with our guests. During your stay, you are warmly welcome to pick anything you like - all vegetables are completely organic and additive-free. Experience authentic farmlife - feed the chickens and try some free-range organic eggs and milk. We are also happy to cook for you something traditional or try some of your local specialties. Quiet time between 10 pm and 6 am. You can contact Skvor through the Contact Host button on this page. If you've already booked, go to My travels. Interested in more accommodations around Breginj?